While JAFSCD is a scholarly journal, we believe that publishing well-written and valuable stories from professionals, activists, and program participants in the food movement, both enriches knowledge, policy and practice, and provides a professional development opportunity for authors. Sharing your voice or the voice of a client you work with is also a way of educating researchers, scholars, and students who study food systems. In a way, it is a means of telling it like it is (including the challenges of food systems work as well as the opportunities, best practices, and innovative strategies) to help prepare anyone who wishes to visit your community and collaborate with you on a project. If shareholders think it is beneficial, the JAFSCD Shareholder Consortium may establish a story-telling community of practice in which authors can share their stories for peer feedback before submitting to JAFSCD for editing, formatting, and publishing. Reflective essay (in first person: I did this, we did that) 1,000 words max. Case study (always third person: they do/did this or that) 2,500 words max. Project evaluation summary (we did this and that) 500-1,000 words max. Innovation story (we or they did this or that) 500-1,000 words max. Do always ask permission to quote someone. Do get signed releases for photos. Do always sound reasonable, balanced, thoughtful, and matter-of-fact. Do avoid clichés and commonly known and generally accepted truths (e.g., poor people are hungry, or farmers are struggling). The audience is mainly people already familiar with the issues, but they are struggling with the how tos. Do be careful about describing people as victims; they have agency, and we disempower them when we think we know what they need and then do it for them. Do be humble; admit to failures. Practitioners and professionals highly value frankness and candor. Do get into the nitty-gritty details of a problem and a solution, but don't go on tangents. Do give interviewees a chance to see what you've written about them and give you feedback. Do let the people you are helping speak: use quotations, paraphrase, and give them credit for ideas. Do not create straw-man arguments. Do point out exceptions to rules, but acknowledge when a case is exceptional, not common. Of course, exceptions can inform practice guidelines and policy-making. Do back up anything you present as a fact with a citation or with your own tried and true experience. Do question the motives and knowledge of authorities and experts, but in a respectful way. Do send anyone you interview or quote a published copy of your piece so they can share their contribution to the food movement. Do use probing questions, but don’t lead an interviewee where you want them to go. Keep it real, not a preconceived narrative you have in mind. Don’t paint things in black and white terms. Shock value is of little value to your professional colleagues. The world is complex, nuanced, and gray all over. Don’t grind an axe, be petty, or make personal attacks. Don’t be hyperbolic (emotionally charged) unless that is the expressed voice of an interviewee. Don’t be self-congratulatory; let your actions speak for themselves. Don’t announce that something is a “model” unless you mean that it is a work in progress, not a proven ideal. Don’t put words in interviewees’ mouths. Be patient and give them space to speak and figure out the words themselves. Don’t submit a project report unless it is brief and useful to other programs. Keep it short, sweet, and matter-of-fact. There are two ways to submit a Voice to JAFSCD: online (preferred) and direct. If you are comfortable following detailed instructions and completing an online form, then go to our editorial management system, Manuscript FastTrack, to create your account and login. Follow the instructions on the screen, which take you through the submission process step by step. There is help within Manuscript FastTrack you can refer to as well. After submission, you will receive a confirmation email, and you will receive notifications throughout the publication process. If you have any questions, please contact managing editor Amy Christian. If you prefer JAFSCD to upload your story, email it to Amy Christian as a Microsoft Word file. Please include a contact name and email for the primary author. 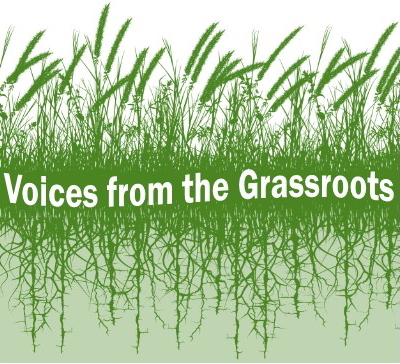 If you have questions about a submitting a Voices from the Grassroots story, contact Duncan Hilchey.